It seems that everyone is talking about the newest “super food”, kale. This leafy vegetable looks like some type of lettuce but experts consider it more like wild cabbage. It comes from the same species that brings us broccoli, Brussels sprouts, cauliflower and collard greens. What is it about this vegetable in particular that has created such a buzz and why should you consider incorporating it into your regular diet? Cabbage traces its history to fourth century BC Greece and it is considered the ancestor of this other leafy vegetable. 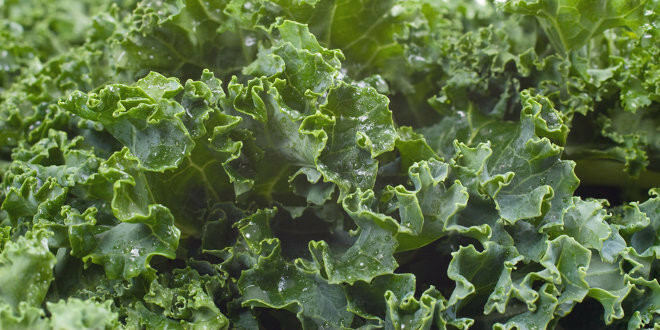 Kale, also called borecole, was once one of the most common green vegetables found in Europe. Russian traders introduced their varieties to Canada and the United States during the 19th century. The World War II campaign “Dig for Victory” promoted the cultivation of this vegetable due to ease of growth and nutritional value that supplemented what Americans received during periods of food rationing. Nutritional value is also why so many people are talking about this vegetable today. The leaves are high in vitamin C, vitamin K, calcium, and beta carotene. 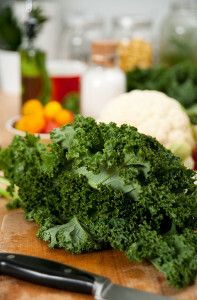 Kale is also a source of the carotenoids zeaxanthin and lutein, which promote eye health. It even contains the chemical sulforaphane, which is shown to have anti-cancer properties particularly when the vegetable is minced or chopped. When reaping the benefits of sulforaphane is the goal, steaming or stir frying the leaves is recommended over boiling them. This veggie also serves as a source of a chemical that enhances DNA repair within cells and may prevent cancer cells from growing. It even has benefits for people attempting to control their cholesterol. Research has revealed the presence of bile acid sequestrants, a group of resins that decrease dietary fat absorption and reduce cholesterol. Steaming the vegetable increases these properties. All told, this vegetable is considered one of the healthiest of its kind. A cup has 33 calories and a powerful punch of antioxidant vitamins: 134 percent of vitamin C, 206 percent of vitamin A, and 684 percent of vitamin K. A study published in the American Journal of Clinical Nutrition reveals that a diet high in vitamin K can reduce risk of development of or death from cancer. This vegetable also serves as a good source of several minerals including iron, potassium, copper, phosphorus, and manganese. With the goal of eating more of this leafy vegetable, take a year-round approach. There are many veggies to choose from during summer but when temperatures drop, fewer varieties are in-season. This vegetable and its dark, leafy counterparts take center stage during cool weather because this is when they thrive. As a result, there should be no problem finding kale recipes suitable for colder seasons. Whether enjoying a kale salad for lunch, preparing a kale chips recipe when a snack craving hits, or enjoying a smoothie that features this leafy vegetable, anyone can get a healthy serving of vitamins, minerals, and other included nutrients. Many recipes are available online and there are even entire cookbooks devoted to cooking with this popular veggie. To find the freshest version of this vegetable, look for leaves that are firm and feature rich color, attached to hardy stems. Leaf color ranges from dark green, to purple, then becoming deep red. The smaller the leaves, the milder and more tender the flavor. After purchasing this veggie, refrigerate it unwashed in a sealed, airtight plastic bag. This should keep it fresh for up to five days. Short periods of cooking preserve the color, flavour, texture, and nutrients of this leafy vegetable. Rinse the leaves, chop them finely, and add them to soups, salads, casseroles, and stews. Steam leaves for approximately five minutes for a tender side dish. Substitute this veggie when recipes call for collard greens or spinach. The leaves are even delicious raw. Kale is one of the few vegetables that freezes well. In fact, it becomes more flavourful and sweeter after it has been exposed to frost. When they are dehydrated or baked, leaf consistency resembles a potato chip. Curly varieties are most popular for making chips but this is just one of the many versions that people enjoy worldwide. In general, vegetables are low in calories, fat-free, high in fiber, and rich in nutrients. They should be standard components of a healthy diet. We should consume four to five servings of vegetables each day and kale is one veggie that provides substantial added benefits. Most supermarkets and vegetable stands have begun stocking kale to meet increased consumer demand, so you should not have any problems stocking up your pantry! Try our recipe: Kale salad with zucchini, sun-dried tomatoes and Asiago cheese. Posted by Buzz4, one of our dedicated staff members!